On September 27th, the Supreme Court of B.C. dismissed Peninsula Logging’s application to extend the Injunction against protestors who erected a blockade leading to BCTS A87125 cutblock. The Judge ruled that there was insufficient evidence to justify the extension of the Injunction and as of this date, the Injunction does not stand, and cannot be enforced against protesters. If another roadblock is mounted to prevent Peninsula from entering their work site, Peninsula would have to obtain a second Injunction to have the RCMP clear the road. We’re hoping that it doesn’t come to that. The best case would be if this local logging company respects the wishes of the community, hauls out the fallen timber, packs up and leave. At this time, they’ve logged 2/3 of ‘The Twist & Shout Forest’ with a large portion of the westerly side of the block still intact. As of today, the area where the popular Twister Trail runs through has been about 15% logged. As a result, the ‘Elphinstone Forest Protection Camp’ has risen again with fresh campers minding the spur road. You are welcome to drop by, bring a food item, firewood or drinking water and discuss the issues. The Judge appeared to be quite receptive to our cause of protecting this forest, and allowed many to speak while taking notes. His ruling was based on a technicality that was overlooked by Peninsula Logging’s legal team, however we felt his heart was with us. 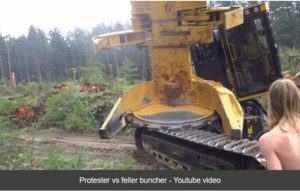 As a stark reminder of the destruction happening in the forest, see the above video of an encounter between a forest defender and a feller buncher operator working for Peninsula Logging in the block last week. It’s obvious that the young men came to stop the machine from working, which has been accomplished a few times before, without incident. When the operator sees people approaching he’s supposed to shut his machine down right away and come out of his cab to inform them that they’re in his work area. Take a look at the operator’s actions and how he manoeuvres the machine dangerously close to them. The defenders are planning to make a complaint to the RCMP. Thank you for your moral and financial support of ELF during these past busy few months. We’re re-building our coffers to pay for expenses related to this campaign, and future ones coming. Defending our local forests seems to never end in this day and age of resource plundering. However, today’s small victory in court has given us all encouragement. Please consider mailing your 2016 donation to ELF at PO Box 85, Roberts Creek, BC V0N 2W0, or going online at our web site and contributing through PayPal.